Rejecting Keystone isn’t a comprehensive solution, but it would signal that the easy cycle of business as usual can be disrupted. A few years ago, it would have seemed implausible that a group of Midwestern ranchers and Native Americans would gather on the National Mall in opposition to the Keystone XL pipeline, as they did on Tuesday. Not because the union is so unlikely, but because the pipeline’s approval seemed all but certain. “We bring you pickles from the heartland,” said a farmer in a red baseball cap, extending a jar to a Native American elder. At his feet lay other gifts—jewelry, blankets and more homemade preserves—exchanged between members of the Cowboy and Indian Alliance, a coalition of ranchers, farmers and Native American tribes leading a weeklong protest against the Keystone pipeline. 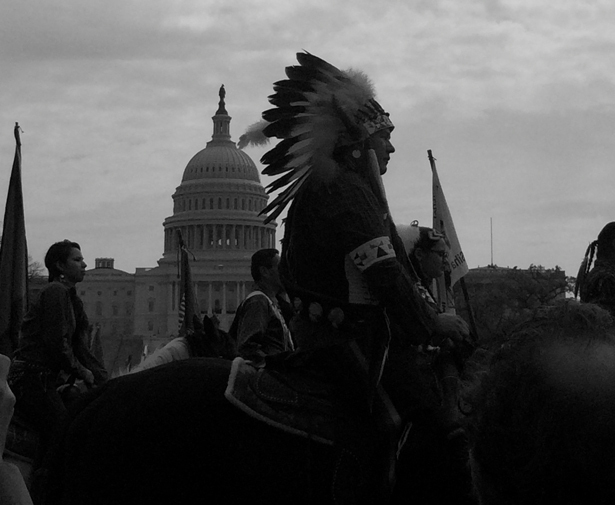 Later, riders on horseback made their way down the National Mall towards a cluster of teepees, which will be the hub for other action throughout the week: traditional water ceremonies to highlight the threat the pipeline poses to water resources like the Ogallala aquifer; an undisclosed “bold and creative action” at the White House on Thursday; and a rally on Saturday that organizers expect to draw several thousand people. The campaign against Keystone isn’t ultimately about the impact of a single infrastructure project. The link between the pipeline and the future climate is indirect—the real point is the campaign itself. While the outcome of the Environmental Protection Agency’s rule-making process for carbon emissions from power plants may make a bigger contribution to the climate fight in absolute terms, there is no single law or decision that can “solve” the present crisis. Besides, it’s hard to imagine people chaining themselves to the White House fence while advocating for stricter bureaucratic standards. The first Earth Day illustrated how popular movement precedes political action. The 1970 demonstrations brought out some 20 million Americans, seemingly spontaneously. Within four year the agencies and legislation that undergird all of the environmental protections that matter today became law: the EPA, the National Oceanic and Atmospheric Administration, the Clean Air Act, the Clean Water Act, and the Endangered Species Act, to name a few. Now, one of the most needed regulations is a tax on carbon—a way of making fossil fuel companies pay for damage caused by their product. Such a tax could provide funds for badly needed investment in renewable energy and sustainable infrastructure while creating some incentive to keep fossil fuels in the ground. We know 80 percent of discovered reserves need to stay there if we want a chance to keep warming below the two degree Celsius threshold scientists say is critical. As Chris Hayes writes, this is essentially asking energy companies to give up at least $10 trillion in wealth. Currently the path to regulation of this sort is politically impassable. But the anti-KXL campaign, with its ability to stoke energy and build diverse coalitions, right now looks like one of our our best chances to provoke the political shift necessary for more radical change. The decision about the pipeline does itself matter, however. Given the overwhelming sense of paralysis, it’s easy to forget that inaction is a choice. We are electing a future of massive suffering. What Keystone illustrates so well is that we—the public and policymakers—make decisions about our climate future in any number of ways, both large and small, every day. Whether we drive or bike; whether we seek out modest ways to live or consume as much as we can afford; whether we drill deeper in search of profits or walk away from them. Many of these actions don’t feel like choices, and all of them are trivial in isolation. Together, however, they are the sum of our fate. The scale of climate change is such that all “solutions” will be inadequate and imperfect. Rejecting Keystone isn’t a solution, but it would be a signal that the easy cycle of business as usual can be disrupted. That radical choices can be made, the kind that have nothing to do with buying a Prius instead of an SUV. That even as the avenues to democratic participation are closed off, there is still power in popular protest.